Working full-time on a new collection of paintings, my focus was not on me and my health. I was over 300 pounds and 71 years old. My eating habits were not the best. One day I realized my body was not ready to accept the future success on my art show and that I could not achieve a healthy weight loss on my own. As a Santa Cruz resident, I had heard a radio commercial on my favorite FM station about the friendly staff at a local weight loss clinic called The Healthy Way. I decided to go check it out — It was the best decision I had ever made. 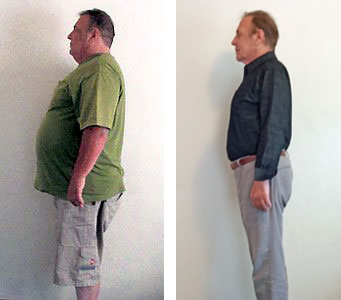 I gave their treatment the same dedication I gave my paintings and in the past 17 months of putting my trust in them, I have lost over 100 pounds. I have never felt as healthy as I do now. I believe I have greatly improved my quality of life and living. I am energetic, confident, and ready to exhibit my new artworks. I want to thank all the staff at The Healthy Way for guiding me back to good health and good food habits — I will never go back to eating like I used to. Currently, now that I reached my goal weight, I am being taught how to maintain my weight while eating in the real world — It is a two month maintenance program, which will guide me and my eating choices, for the rest of my life. Lost 103 lbs The Healthy Way!